Douglas C. Engelbart, computer visionary and inventor of the mouse, has passed at away at the age of eighty-eight. You'd be hard pressed to find a more common computer tool than the humble mouse. Whether you're surfing the web or partaking in a cordial session of first person shooting with other fans of fragging, you'll have probably used a mouse in the process. If so, you owe some gratitude to Douglas C. Engelbart. A pioneer of early computing, Engelbart, who has sadly passed away at the age of eighty-eight, was the man behind the mouse. 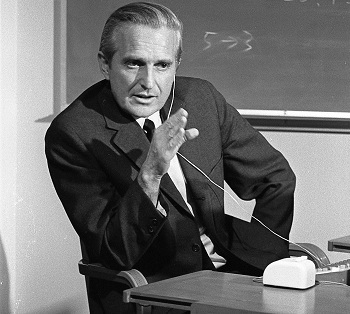 Engelbart devised the mouse in 1964 when he drew up a conceptual sketch of the device which his colleague, William English of the Stanford Research Institute, had fashioned into a prototype. Engelbart would receive a patent for the mouse in 1970. While the invention of one of the most widely used computer input devices in history would probably be enough laurels for some to rest on, Engelbart would also go on to pitch one of the first visions of networked computers. "Doug was a giant who made the world a much better place and who deeply touched those of us who knew him," said Curtis R. Carlson, president of CEO of SRI. "We will miss his genius, warmth and charm. Doug's legacy is immense -anyone in the world who uses a mouse or enjoys the productive benefits of a personal computer is indebted to him."